A cryptic message on the phone. A pair of blood caked shoes. 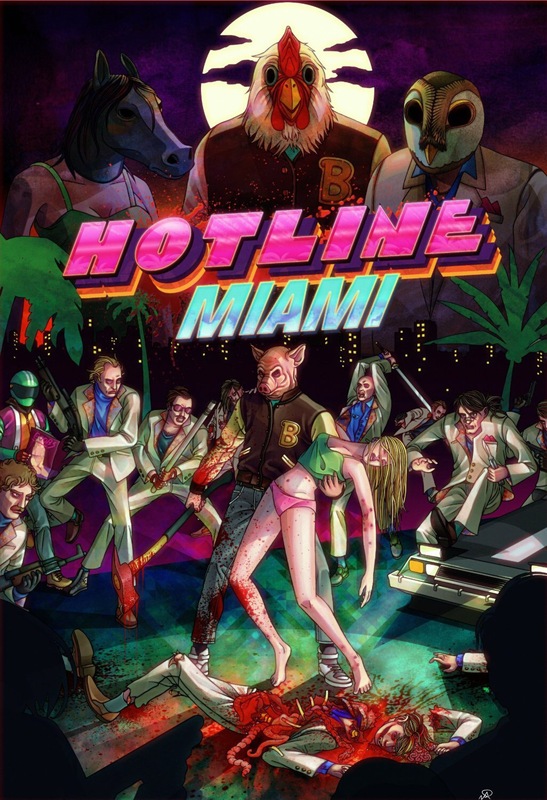 Released in 2013, Hotline Miami is a top down twitch based shooter set in the steamy summer of 1989 in the crazy city of Miami. Hotline Miami is an extremely difficult game to nail down. Most games have cohesive narratives that follow a simple plotline with a logical conclusion. 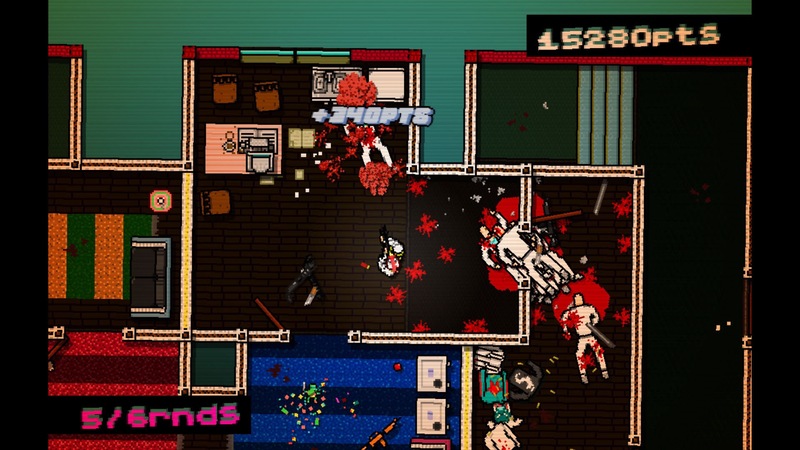 Hotline Miami changes perspectives, jumps from one time period to another, and even has diverging realities. There’s no real easy way to explain this game, so let’s just start with the presentation. Out of all of the confusing and difficult to judge things in HM, the presentation is easily the clearest. It is simply brilliant. It takes on a very retro style, even to the point where colors are dulled and there’s a graininess over the screen. The colors range from silvers and browns to red and yellow neon, however with that said all of the colors are a bit hazy. This really helps the player fully realize the time period the game is meant to be set in, the 1980s. The mixture of bright colors and dull tones gives off this twisted and uncomfortable aura throughout the entire game, as if no matter where you look something is just a little off. The music is equally as gripping and stunning. It takes on this disco tech/ heavy techno theme. It mixes exciting club music with melancholy psychedelic tracks. The composer, Scattle, did an excellent job bringing this soundtrack to life and giving it such a palpable sense of unrest. Every song is different and varied enough to where you don’t really get bored of the tracks, and no matter which track you listen to you won’t be able to escape the uncomfortable feeling the music gives, much in the same way that the graphics and art design do. Hotline Miami does more than just look good though, it also plays well. It takes twitch based shooting to the next level as you cleverly maneuver through buildings chock full of Russian baddies. Every chapter begins with the player receiving a cryptic phone call that gives you your new murder mission. Once at the location you can choose to dispatch each opponent however you see fit, whether you want to sneak around with a melee weapon or literally go in guns blazing. Though this sounds very straightforward there are three major factors to how every level will play out individually. The first factor is the level design itself. Despite the fact that the game technically allows you to play every level the way you want, the layout of the level is much more influential in the way you play. Some levels force the player to be more stealthy while others are nearly impossible to complete without a rain of gunfire. On one hand I applaud the game’s ability to direct the player down a certain path and force them to think on their feet. On the other hand the restrictive gameplay conflicts greatly with the games more action orientated approach. At times it feels more like a puzzle game than a shooter. That’s not a bad thing per say, but switching styles like that from level to level can add another layer of difficulty to an already challenging game. The second factor that affects the way you play is the weapons that you use. This is the main crux of the game as these weapons will determine whether you live or die. It’s important to note that most weapons kill in one hit, and likewise you can be killed in one hit. On top of those weapons, you can also use door slams and your fists to knock down enemies and then commit brutal finishing moves. Really everything is brutal about this game. Every gun blows the enemy to smithereens and every baseball bat and crowbar rips the foe apart. It’s a little unrealistic at times but always impactful. The sounds and animations go a long way to make every kill feel even more grotesque and uncomfortable then the last. Despite the way the game feels the tools themselves are largely useless. You unlock dozens of weapons in the game that are randomly scattered throughout the levels. Do to the unpredictable nature of their placement you rarely get the opportunity to try out a new weapon. When you do get the option to fight with a new weapon, chances are it’s significantly less useful than one of the more common ones. For example you have the opportunity to unlock a revolver in the game. It’s a semi-automatic pistol with six rounds however you never really need to use it as one of the most common weapons in the game is a shot gun. The shotgun also has six bullets and fires fairly quickly. On top of that the shotgun has a wider spread, giving you a better chance to nail your enemy, rendering the revolver useless. This same issue of uselessness appears with dozens of weapons. Though it’s not a major drawback it is a bit of a waste. I would have preferred fewer weapons if they were more varied. The last component to Hotline’s gameplay is the masks, of which there are many. At the start of every level you can choose a mask and at the end of every level you unlock at least one new mask. Each mask has a unique ability ranging from increased health, more ammo, faster movement and so on. Each mask is useful in its own way for one play style or another. This really caused me to pause at the start of every level so I could pick the right mask since you can’t change your mask after the level begins. All of these components, level design, weapons, and masks work together with the tight controls to deliver a fast paced and visceral experience. When done right the game can have this unique sense of flow which makes it easy to get larger combos and get a higher score. However at other times you can be cornered and forced to plan out your attack and trick your enemies. Either way there is an impactfull and exciting felling that provides some of the most addictive gameplay available. The only real issue with the gameplay is that every once in awhile you will get killed by an offscreen enemy. Though that doesn’t happen often, when it does happen it feels very unfair. 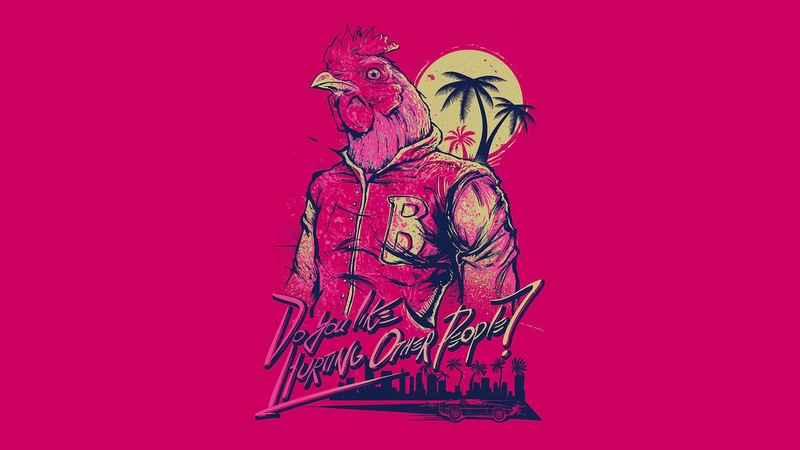 Last but most certainly not least is the story of Hotline Miami. As I mentioned before the story is complex as it jumps between timelines, hops in and out of dreams, and switches perspectives. There isn’t much dialogue, and whenever something is said it’s almost always cryptic. What’s worse, the ending is ridiculously anticlimactic. But despite the poor quality of the plot, the theme of the game and the point it attempts to prove is particularly poignant. Really the main theme of the game is violence considering it permeates nearly every single scene. On top of that the theme of violence is coupled with common drug characteristics, such as addiction, confusion, and self destruction; making the suggestion that violence is like a drug. There is further commentary made about violence throughout the cryptic dialogue. All in all the plot is dull and stupid, but the meaning of the story and the commentary it gives about violence is poignant and well worth the ride. Hotline Miami is an insane game that hardly makes any sense, but in that confusion the game delivers an amazing score and art style, an excellent and addictive gameplay, and very poignant commentary on violence. Hotline Miami is a thrill ride that will leave your heart pounding and your mind racing for months.